10 Best Indoor & Outdoor RC Helicopters For Beginners, Kids & Big Kids! In this guide we’ll look at the best RC helicopters. First up, we’ve got the Blade E-flite mCX2 RTF which is exciting, speedy and ready-to-fly. It’s a micro-helicopter and suitable for beginners, with everything you need to get going included. This model has a precision swashplate with user-selectable control settings – meaning it can perform at high speeds for experienced pilots, or easier settings for beginners. The design of this helicopter is seriously impressive. It has a sleek new body and flashing LED lights so it’s perfect for night flying. The powerful, dual micro coreless motors makes this helicopter fun to fly as well as speedy, and the stability and control is practically unrivalled. This helicopter is durable (so long as you don’t crash it too often! ), and perfect for pilots of any experience. Next up we’ve got the VATOS RC Helicopter. This little helicopter is lightweight and stable to fly. It’s easy to control but also exceptionally crash resistant, thanks to its high quality metal frame, making it perfect for those not-so-experienced pilots! This helicopter charges in 40 minutes and has a 10-12 minute flight time. It has 3 frequences to let you fly up to 3 helicopters at once, and is equipped with the latest gyroscope technology to stabilize the helicopter in-flight. Great for both beginner and experienced pilots. This helicopter has multi-colored LED lights which make it fun and easy to fly in the dark. Wait until the evening, switch off the lights and see what you can do! Finally, the soft blade ensures your safety while flying. When the blade gets stuck, the helicopter will power off automatically to protect itself and the controller. The EXCOUP remote control helicopter is predominantly suited for indoor use, but it can be taken outdoors on calm days. The LED lights make flying in the dark fun and exciting. This helicopter can be controlled from a distance of 12m. It’s family friendly and easy to fly, with the durable frame and case able to take an impact or two! This helicopter comes with replacement blades and other spare parts, in the event of an accident. This helicopter is recommended for indoor use, but can be flown outside on calmer days. It arrives ready to fly and is a fantastic price for what will be hours of fun. Another micro heli, the Blade mCX BNF is a neat little model that requires just the transmitter to get going. It’s great for both beginners and experienced pilots, with fantastic stability and control. This model has a flight time of 6-8 minutes and takes just 30 minutes to fully charge. It’s powered by a single cell Li-Po battery, and the 4-channel control helps with precision for flying in tight indoor areas. Finally, this model is very durable, although the motors will wear out eventually. It’s smooth to fly and predictable, giving you ample time to perfect your skills in tighter spaces. The Syma S109G RC helicopter is another loved all over the RC community. It’s exceptional value for what you get. This micro helicopter is easy to fly so great for beginners, has good stability and control, and is powered by a durable Li-Po battery. The brushed motor means you’ve got slightly less power than those with a brushless, but for those with little experience who want a fun RC to fly indoors, this is ideal. It can controlled up to a distance of 10m, but ensure you are in a spacious area as walls can cause interference. This helicopter has a built-in Ni-Mh rechargeable battery, and this can usually be charged in about 40-50 minutes. The Syma S107 is the perfect beginners’ RC. It has great stability, and is easy to fly and control, available in 5 bright colors with a high grade metal body frame. Flying is easy with this RC heli. The 32-level high precision rotor blade system allows for a steady lift off. Flight time is around 10 minutes and it takes just 30 minutes to charge. While this can be flown outside in calm weather, it’s recommended for indoor use. This excellent value RC helicopter arrives ready to fly and is exceptionally lightweight. The perfect little model for all ages and levels of experience. Another RC heli that has the serious fun factor is this WL Toys RC Helicopter. Unique to this list, this helicopter comes with a water pistol which can shoot water 5 foot, a feature that can provide hours for fun for all the family. This helicopter is great to fly and durable. It comes fully assembled and flight time is about 10 minutes. It’s exceptional value for what you get, easily standing up to more expensive models, plus it has the water pistol for even more fun! This helicopter has an acceleration boost for that extra bit of forward speed, and it’s easy to turn. The stability is good, and the LED lights are a nice added touch. The SkyCo Missile Shooting RC is a seriously fun heli. This model contains six plastic missiles with auto rapid fire capability to add some extra excitement to your flight! The bright LED lights come into effect when shooting to give the game that added buzz. The design of this helicopter is second to none. The body is highly detailed and great to look at, and the built-in gyro makes this model easy to control and stable while you take out the enemy! This model is powered by a Li-Po battery (not included), and has a range of up to 10m. The flight time is 10 minutes, and it’s suitable for flying outside on a calm day. 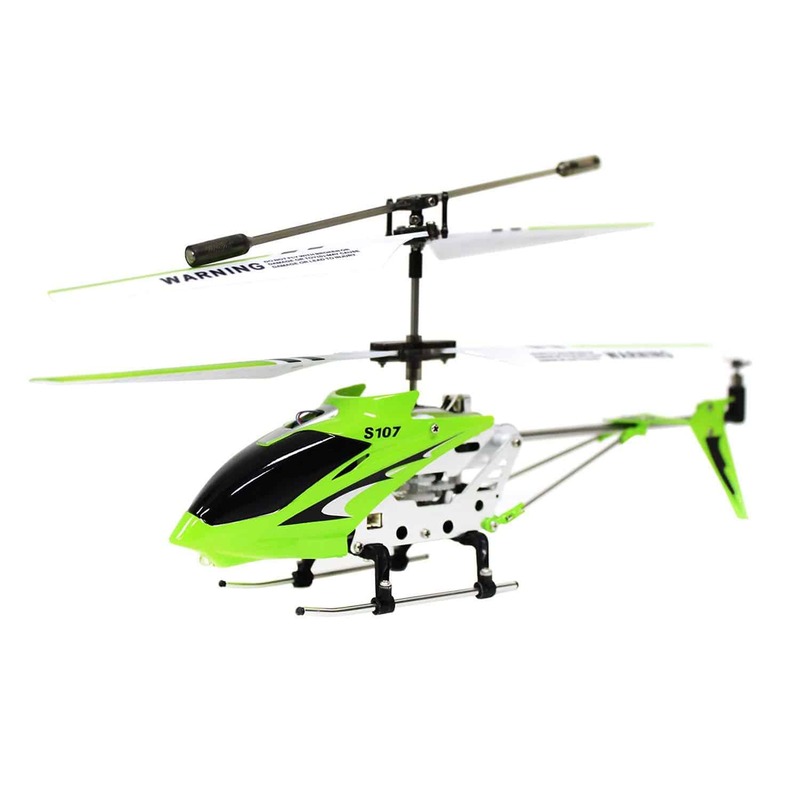 The Syma S111G RC helicopter with gyro is smooth, easy to control and has a great design. It’s well balanced with a 6-7 minutes of battery life – more than enough time to perfect your skills before you charge it up again. This helicopter is great for indoor use and can be easily flown around the living room. It’s powered by a Li-Po battery and has a brushed motor to give it enough power for that fun feeling. This helicopter has a 3.5 channel frequency for ease going up or down, left or right and forward or backwards. It’s great for learning to fly, and can be controlled up to 8m away. The final RC helicopter on the list is the Blade 70S which is small and light, perfect for less experienced pilots. It’s a great model for perfecting your skills before you move onto something more advanced. This model is equipped with safe technology. The fly bar less technology offers great stability in the air, but the brushed motor and 150mAh battery still provide enough power for a seriously fun fly. The best thing about this model has to be its durability. All electronics are contained by a tough plastic frame to keep this model safe if you have a crash. Overall, a high quality helicopter that’s best suited to beginner pilots. Purchasing your first RC helicopter is exciting, but being faced with the array of options can make things a little stressful. 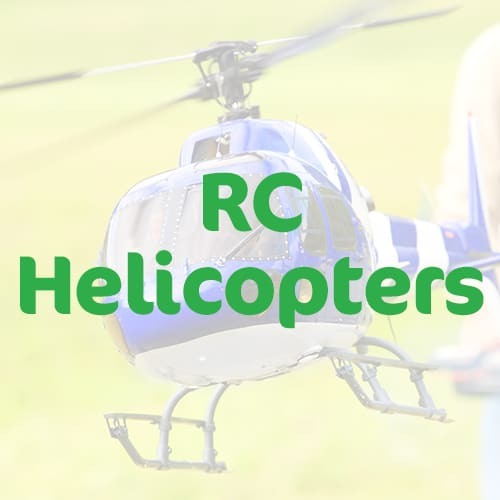 If you’re diving into the world of RCs and need that perfect helicopter to help turn you into the pilot you know you can be, you’re going to need a little help. Whether you’re after a family-friendly flight in your backyard, or you want to wow onlookers at your very first RC helicopter meet-up, there’s the perfect helicopter for you out there. RC helicopters are more than just toys, and buying an inexperienced pilot more than they can control can be dangerous for both themselves and others. For a total beginner, an electric powered, indoor RC helicopter is the best option. Anything that’s designed for outdoor use will have more power which will make it harder to control. Electric, ‘toy-like’ helicopters are best for learning, as the controls are often very simple and the helis easy to fly. These helicopters are usually cheaper too, and once the beginner has mastered the basics they can start on something a little more advanced. Working your way up from easy-to-use, electric models to gas-powered helicopters suitable for outdoor use and competitions is best, and provided you look after your heli, they can easily be sold online second hand. For a child or beginner, try to find the most durable helicopter you can. Those made with metal frames are best and these are likely to withstand a crash or two. However, with indoor helis, the range of control is likely to be no more than 10m, and even crashing from that height is unlikely to do too much damage. RC helicopters can range from the cheap and cheerful to eye wateringly expensive. Those suitable for competitions and those that can withstand wind will be more expensive. These will be gas-powered helis with stronger batteries, and brushless motors. The parts are expensive to replace, and they require serious maintenance. These will also require skill, knowledge and experience to control. Cheaper models will either be micro helicopters or RCs specifically designed for indoor use. The cheapest of the bunch will be very ‘toy-like’. You won’t be able to control them from far away, and they won’t require much in the way of skill to fly. These will be battery powered, electric models. They may be made of plastic but, provided you look after them and don’t crash too often, should last a while. They will also have far shorter flight times – 10 minutes at best. RC helicopters comes in a range of sizes from various brands. Smaller, lightweight or micro helis are great for beginners but not good for outdoor use, while larger more powerful helis are harder for beginners to control. The most popular brands for RC helis are Blade and Syma, and they produce RC helicopters for a range of pilot experience. As with everything, check out online reviews before you buy and stick to your priorities. RC helicopters can be as complicated or as simple as you like. With technology moving at the speed it is, it’s now possible to add a range of features to your helicopter to make it more fun or easier to fly. RC helicopters with the gyro included will be easier to fly, and this is an essential if you’re a beginner. The gyro is a little box which attaches to the heli. It detects any swinging movement of the helicopter and will automatically correct this. While design is important, durability is key. Repeated drops from height will damage your RC eventually, so purchase one made from high quality plastic or metal. However, RC helis that look awesome as well as performing well are easy to find and becoming more affordable. Beginner’s needn’t worry about performance, but as you get more advanced this might be something you take into consideration. Durability is key for a beginner, but as you move up the ranks and head outdoors, you’ll want something that’s stable and can withstand a little wind. The number of channels is integral to the performance of the RC heli. Beginner RC helicopters will be 3-channel, meaning they can ascend, descend and go forwards, backwards, up and down. A 4-channel RC will be able to rotate on its own axis, while 6-channel radios will be built for 3D performance and able to do aerobatics at higher speed. An RC helicopter with a camera is a great way to keep a record of all your flying adventures, and see your home and area from above. These allow you to show off your flights to all your family and friends. Modern RC helis with cameras are high quality and take great footage. Cheaper ones won’t be such good quality. Another option for getting great aerial footage is a drone. However, drones often lack the ‘fun factor’ that RC helicopters give you. While drones produce quality footage, they are less hands-on to fly and require a lot less by way of skill. RC helicopters with guns are commonplace in the RC world, for anyone who wants a little more fun. The most common is missiles which can be fired one at a time or all at once. If you’re after an RC that includes guns, opt for one with a built-in gyro which will keep your helicopter stable while you shoot. Water pistols are another feature that add a little extra fun to your flight. Indoor RC helicopters can now come with built in water pistols and although they’re unlikely to absolutely soak the enemy, they can certainly annoy them. Keep in mind that water pistols will reduce the flight time. Electric RC helis rarely have a long battery life. 6-10 minutes seems to be the norm and they’ll take over 30 minutes to charge. Gas powered RCs have a much longer flight time but these are harder to control for beginners. To increase your battery life, remove any excess weight and ensure your battery is totally cool before recharging it. LED lights are perfect for night flying. Multi-colored LEDs look awesome in the dark. If your RC comes without LED lights, get creative and add some LED strips yourself. Ready-to-fly RCs are best for beginners as these are usually electric helicopters that are fun to fly, but won’t do too much damage if crashed. Build your own kits are very technical. It requires attention to detail and experience to get the most from your RC heli. These bring a new element to flying and, when your helicopter eventually requires some maintenance, you’ll be more clued up on how it all fits together. RC helicopters range from state of the art models that resemble full scale helicopters more than they do toys, to fun and lightweight electric models. Which one you choose will depend on your experience, budget and extra features you’re after. Ensure you buy a helicopter that suits your level of experience, and master the basics before you step up to something more advanced.